Each year at Relativity Fest, we recognize organizations and individuals who build innovative solutions, break down barriers for technology in the practice of law, move e-discovery forward, and take Relativity to the next level. 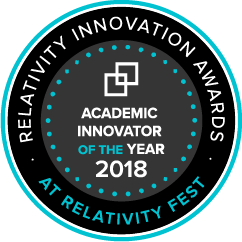 Congratulations to the 2018 Relativity Innovation Awards winners. Learn more about the winners below. The technology categories celebrate organizations that use the Relativity platform in creative ways—solving difficult or unique challenges within and outside of e-discovery. Check out all of the ground-breaking innovations that the Relativity community submitted to the 2018 awards. When helping clients contest a petition to bring a constitutional amendment to a vote in Ohio, Bricker & Eckler developed a highly automated application to review petition signatures without leaving Relativity. The application identified errors or potential fraud in signature collections by scanning the petitions against other data sources, including ID and address records and Google Maps data. Federal agencies face large backlogs of requests and intense pressure to stay on pace in responding. Deloitte built a FOIA application to leverage Relativity’s data processing, analytics, technology-assisted review, and redaction functionality with a workflow designed to meet the unique needs of FOIA processing, including the ability to automate redactions—a game-changing combination of features for this cumbersome process. To meet client requirements, Clayton Utz had to capture all duplicate records relevant for different notices and capture information such as document providers. To streamline this manual process, they built a script to capture the information from the client’s load file and automatically create overlays into Relativity’s custom objects, allowing them to meet requirements, save time, and reduce client cost by 75 percent. The individual categories recognize people who champion legal technology and advocate for those who use, manage, build, and innovate on top of Relativity. Learn more about the 2018 finalists and winners on The Relativity Blog. As an e-discovery practitioner at The Walt Disney Company by day, Peg Gianuca is also an adjunct professor at the UCLA Extension School, teaching paralegal students all the magic of e-discovery. Peg has supported and encouraged students, coworkers, and colleagues continuously and represents the best of e-discovery professionals who continue to learn new ways to do things and persist as champions of change.